It is time to plan your involvement as an exhibitor on July 22 & 23, 2019 at the 56th Annual Convention and Exposition. In 2019, we will be at the Hilton Orlando Bonnet Creek. The convention dates are July 22-24. You will find many exciting opportunities for networking— reaching out to more than 400 aging service professionals, corporations and their key decision makers. You'll have 5 hours with convention attendees. 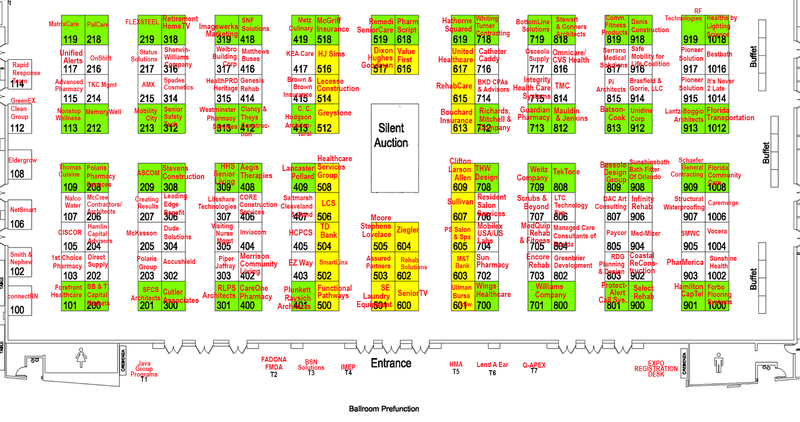 Click here to view the floor plan and to make your booth selection. Click here to view the Prospectus which includes the logistics of the Expo and the booth application rate sheet. Are you interested in joining LeadingAge Florida? Click here to obtain the membership application. LeadingAge Florida has a sponsorship package engineered to the exact specifications of our partners, designed to fit your budget, and tailored to meet your marketing goals. Please review the options available to you by clicking here to be redirected. Contact LeadingAge Florida’s Exhibit and Sponsorship Coordinator, Julie Copeland at JCopeland@LeadingAgeFlorida.org or (850) 702-0317.